At Babyology we love a nursery that’s a little different. 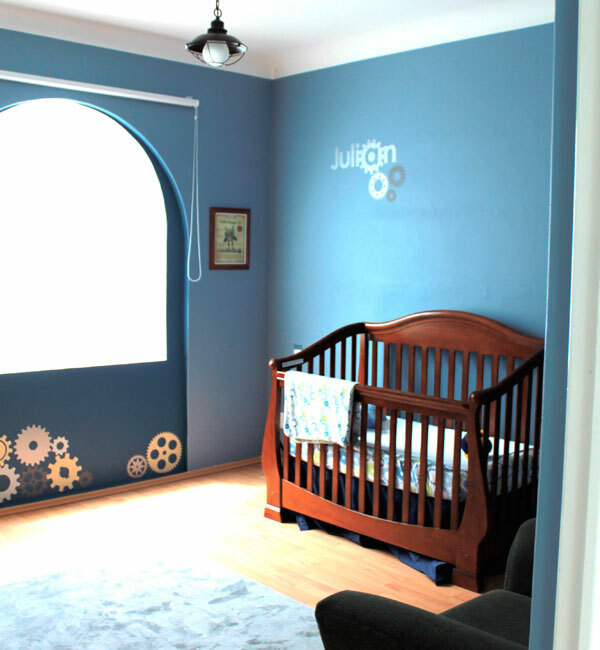 With that in mind, we give you a glimpse into Julian’s steampunk nursery! 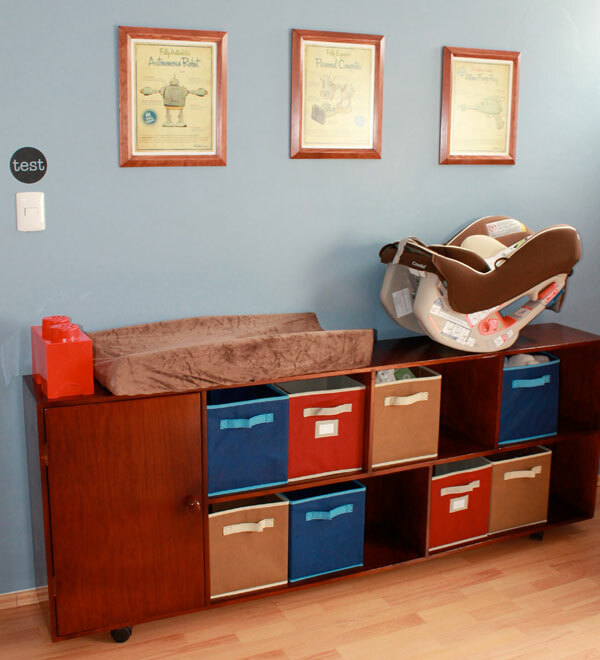 Julian Leon’s nursery comes to us all the way from Mexico City. Julian’s mother Ana writes the following about decorating the space that was set to become her special little boy’s nursery. 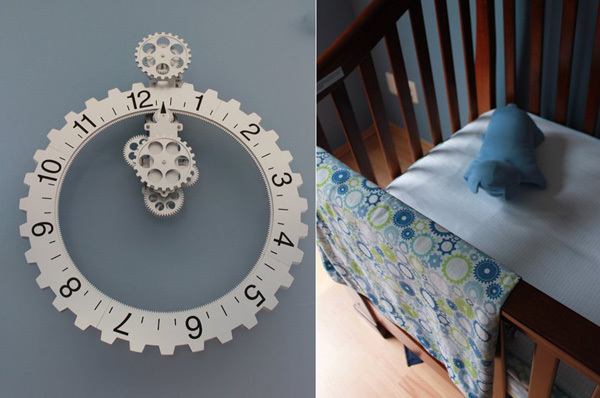 When I learned I was pregnant with a boy I immediately wanted to decorate the room in a Steampunk inspired aesthetic. It was not easy because most things that are steampunk seem too old-fashioned for a nursery, or they seem too dangerous to have around kids of any age. I looked around to find prints that would give the idea of machinery, including the decals that are not dangerous for a little boy to be around, and used the walls in the apartment that had arches already into the wall in a way that seemed that the gears would be bolted and working inside the wall. Using as a main focus point the steam machine and including in that wall an old fashioned radio my father bought for the nursery. 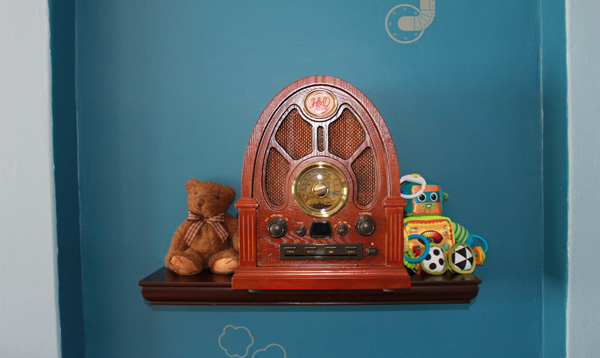 He is seventy-four years old and it reminded him of the radio his grandmother had when he was a little boy. I included toys on the sides to maintain the idea of this being a nursery. Finally the crib was given to us by my husband’s family, I fell in love with it because of the rich dark color but also the details and it is a 4-in-1 crib, we hope our son uses it for a long, long time. A team of four (Ana, her husband and a pair of friends) painted Julian’s bedroom walls this gorgeous blue colour and then Ana carefully chose the wall art to reflect the steam-punk theme. What really made the whole room come together were the prints from an artist I found online called Michael Murdock. I loved the steampunk inspiration, very industrial but also having a sense of science fiction and childlike quality. I bought both collections because I could not make up my mind which would look best. What a marvelous job of combining the old and new in Julian’s nursery, with gorgeous sentimentality and stories to be told at every turn! For details on where Julian’s nursery treasures came from, see below – but please keep in mind that some items won’t be readily available to Australia without a re-shipper!